I never wanted a ship in a bottle before. But then I saw this. And you know what? I still don't want one. I mean, as far as ships in a bottle go, this one is pretty fantastic. 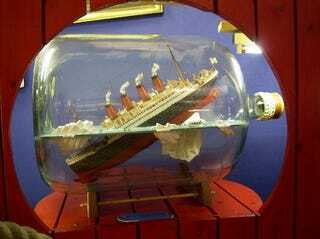 But if you're going to do the whole ship in a bottle thing, you should really strive for accuracy. I mean, this Titanic still has smoke puffs coming out the stacks! And, there's not enough bodies! I used to build models. Lots of them. Mostly military models, though. The majority of them depicted WWII vehicles, ships and aircraft. I'd spend hours painting them, and constructing dioramas to show them in simulated combat scenes. I had to. I only had a limited amount of space for my models. Some of them I really miss, though. Some, like my Curtis P-40 Warhawk that was painted to mimic one of Chennault's Flying Tigers, were works of art. It was one of my larger planes, and I spent many hours on it. I carefully painted every piece before I assembled it. And then, when it was built, I didn't leave it pristine. No, this was painted to mimic a veteran of actual combat. I simulated paint chips, combat damage repairs, leaking oil from the engine. In 1981, when we moved from Minneapolis to Ireland, I had to get rid of it. I couldn't take it with me. It was just too fragile. My best friend said he'd love to have it. And when we moved back after our scheduled 3 years, I could have it back. But no. It was one of my most prized possessions. If I couldn't have it, then I would destroy it. And destroy it I did. It died in what I imagined was a massive explosion. In reality, it was half a dozen Black Cat firecrackers placed in various locations on the plane. They really didn't do much damage. Do my friend and I chucked rocks at it until it was nothing but tiny bits of plastic. Yep. Much more satisfying than letting my buddy have it. For about 10 seconds. Then you'll go on with your day. This is called 'The Ship Of Theseus'. Theseus is a sailor. And he builds himself a ship. It's a very nice ship. And he spent years building it by hand. He was very proud of it when he launched it. And to show it off, he decided to sail it round the world. Theseus was an experienced sailor, so he had a very experienced crew. And he also had other ships traveling with him, to help carry supplies. And as they sailed, as is the nature of ships, things broke. When pieces of the ship broke, instead of repairing the broken part of the ship, Theseus replaced it. The broken part was then transferred to one of the other ships in Theseus' fleet where it was then repaired. Over time, more and more parts broke on the original ship. And more and more parts were replaced. Other sailors in the fleet took the broken pieces of the original ship and, once they repaired them, started using them to construct another ship. As the years went by, Theseus and his men sailed all over the seas. And as pieces of Theseus' ship broke, they continued to be replaced, and the second ship was slowly taking shape. Finally, one day the final part of the original ship broke and was replaced. The broken piece was repaired and placed on the second ship Theseus had built. Which one was Theseus' ship? The one Theseus sailed on was originally his ship. But as time went on, it was slowly replaced piece by piece. If it's no longer Theseus' ship, at what point did it stop being his ship? And once all the replaced pieces were assembled, wouldn't that actually be the ship of Theseus? But if it is, then what is Theseus sailing on? Well.....I'm done. I don't know if anyone will spend any time thinking about this. Personally, I spent a few seconds on it and thought I had the answer. But then, my mind said, "But...." and now, I'm not so sure. I can justify calling them both the original ship of Theseus. But they can't both be the original ship. Yet, I can make the argument for it. But for now, it's late. I'm going to go grab a piece of chocolate, take a drink of water, fire up the Kindle and go read myself to sleep.